According to Wikipedia, Earth Day is an annual event, celebrated on April 22, on which events are held worldwide to demonstrate support for environmental protection. It was first celebrated in 1970, and is now coordinated globally by the Earth Day Network, and celebrated in more than 192 countries each year. 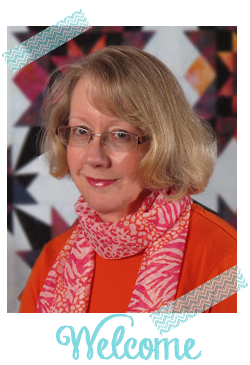 Quilters have been recycling since the first person put layers of cloth together to make a warm covering. 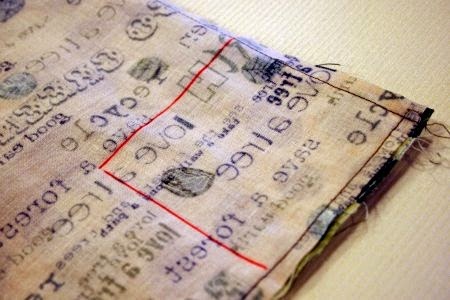 And quilters were stitching fabric bags to carry things way before it was "cool!" 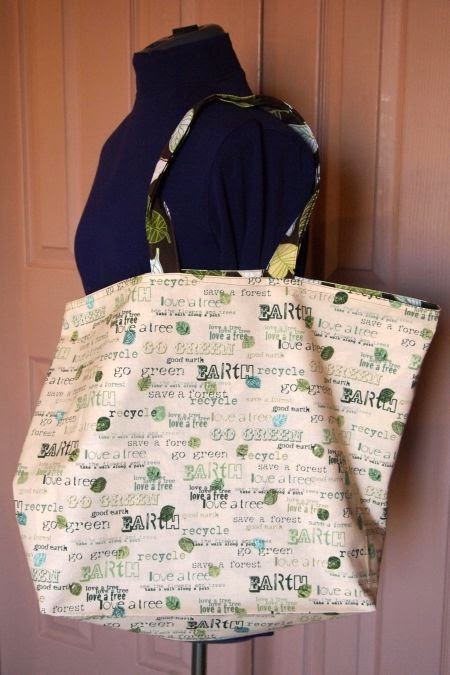 In honor of Earth Day 2014, here is a tutorial to make a basic tote, or "market" bag. 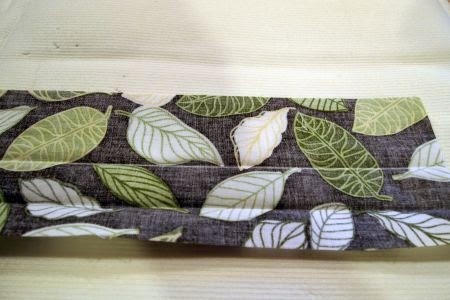 The fabric is from Timeless Treasures and is part of a line of "save the Earth" fabrics. 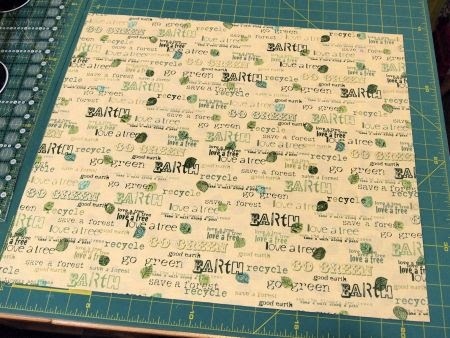 The lining is recycled quilt backing. 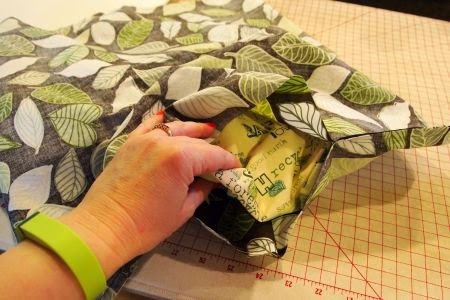 I used fat quarters for the outside of my bag, so that determined the size. 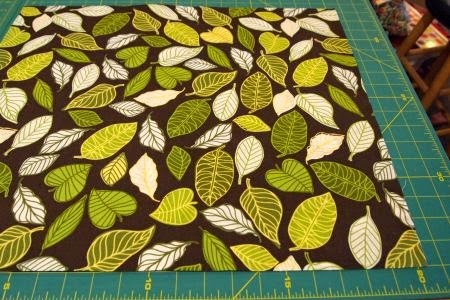 I squared up the fat quarter to the largest possible size, which turns out to be about 21" X 23" -- you can make your bag any size you like! Cut the lining to the same size. The size of the bag handles was determined by the amount of fabric I had left. 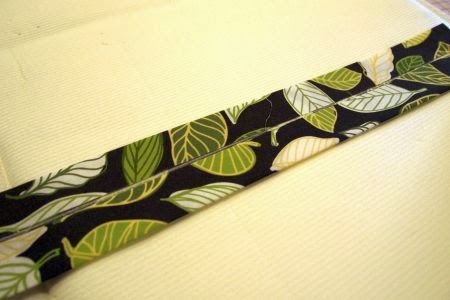 So they were cut 4.5" by about 15" -- again, you are the boss of your bag, make them the length you like! I don't like shoulder bags, so if you do, you may want to make your handles a bit longer. Press each handle in half lengthwise. I made a white chalk mark just so you could see where the center pressing line is -- you don't need to do that. 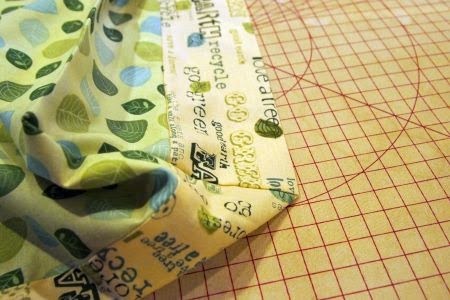 Fold each lengthwise side to the center line and press. Then press the handle in half lengthwise again. 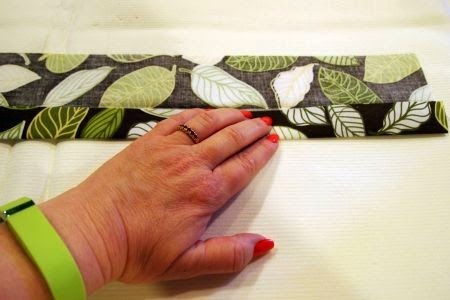 Your handle will be four layers of fabric thick, plenty for light use. 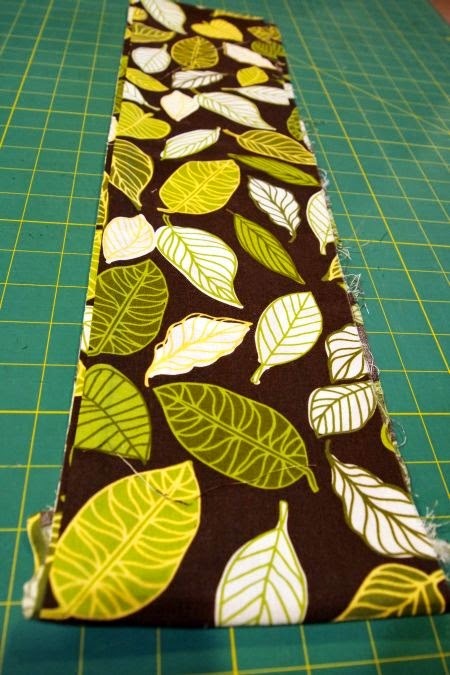 If you want a stronger handle, interline it with batting, interfacing, or fusible fleece. 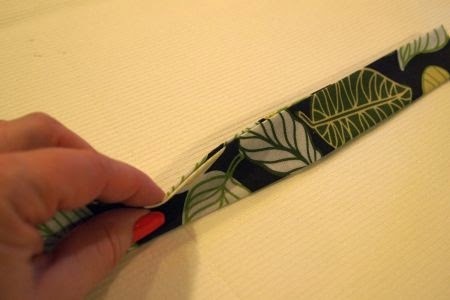 Topstitch each long edge of both handles, stitching as close to the edge as you are comfortable sewing. Mark the center of the top of the bag with chalk, or a pin. 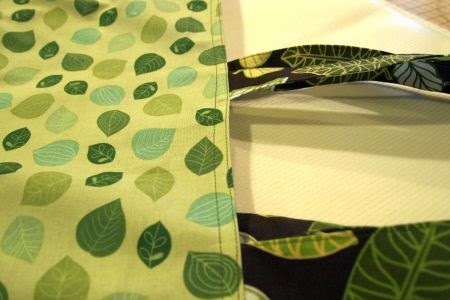 Then pin the handles in place on the lining pieces with the raw edges flush and the handle toward the bottom of the bag. See how I have them lined up on my cutting mat so the edges of the handles are the same distance apart on the front and back of the bag lining? Baste the handles in place. 3. Stitch the bag pieces. 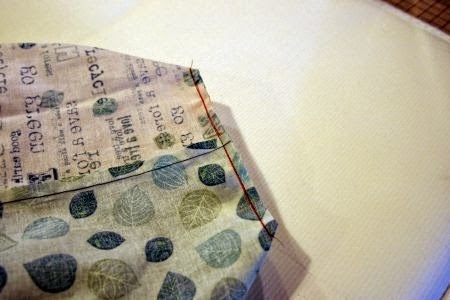 Next, pin the front and back of the lining right-sides together. 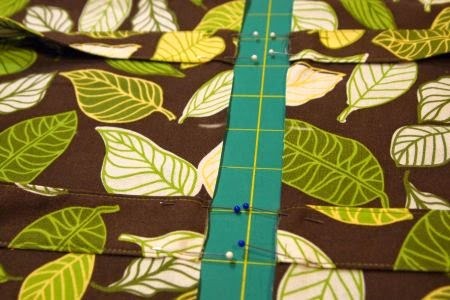 Stitch down each side seam and partway across the bottom. 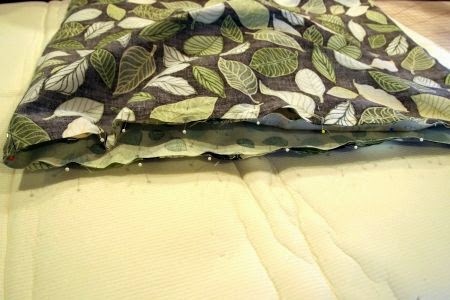 Leave an opening about 6" wide in the bottom seam. 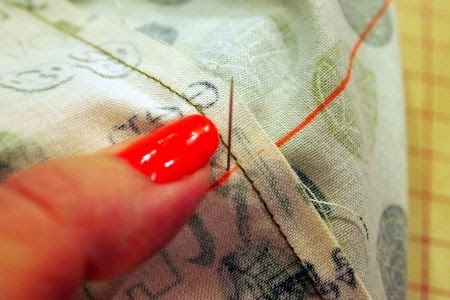 I use red pins to signal "stop stitching here" so I remember to leave an opening in the bottom seam. This will be where I turn the bag right-side-out when the lining and the outside is sewn together. Repeat for the outer layers -- but this time, stitch down each side and all the way across the bottom. 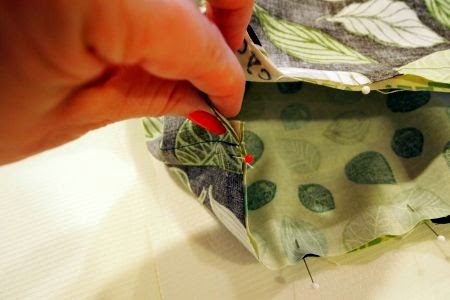 Turn the outside of the bag right-side-out and tuck it inside the lining. Right sides of the bag and the lining will be facing each other. Pin all the way around the top. 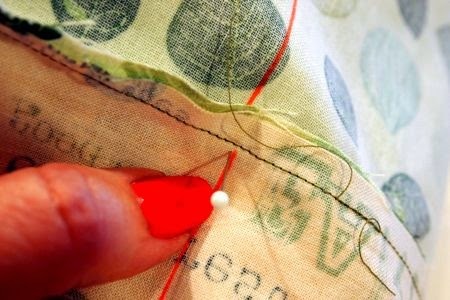 Be sure you don't catch the handles in your stitching. 4. Make the "box corners"
This is another decision point. How wide do you want the bottom of your bag? I measured an existing market bag and determined that each box corner should be about 3" deep. 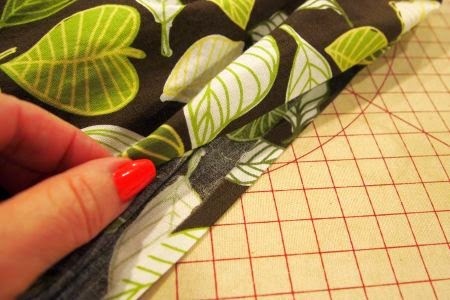 Draw a square 3" from the bottom outside corner seams. 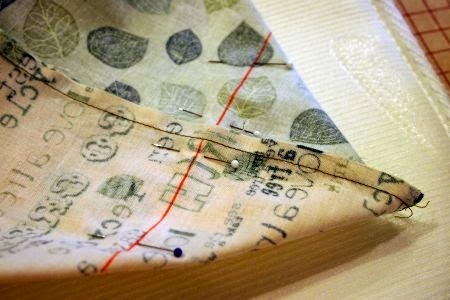 Repeat on each side of each bottom corner of the outer bag and the lining -- you'll be drawing 8 squares. And flip to the back side to see that the layers are matched up. And stitch along that line. Back-tack the stitching at the beginning and end of the stitching line. 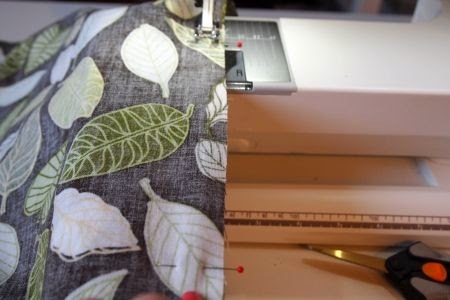 Trim the seam to about 1/4" to 1/2" inch -- use a scissors or a ruler and rotary cutter. Now you're ready to turn your bag right-side out. Remember that opening we left in the bottom of the lining? Reach through it and grab the outside layers of the bag. 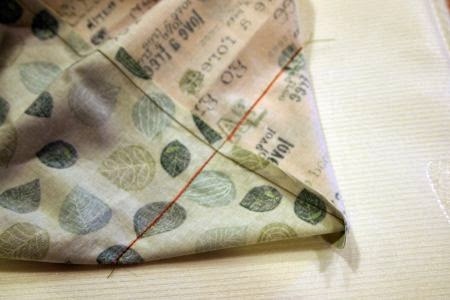 Pull them through and use your fingers to push out the corners of the bag and lining. Press the top edge, making the edges as flush with each other as you can. Edgestitch along the top edge, then again about 1/4" down from that stitching line. I like to press along the front and back bottom between the "box corners." I just think it makes the bag look more "finished!" Updating post to link up to Show and Tell Tuesday at i have to say. 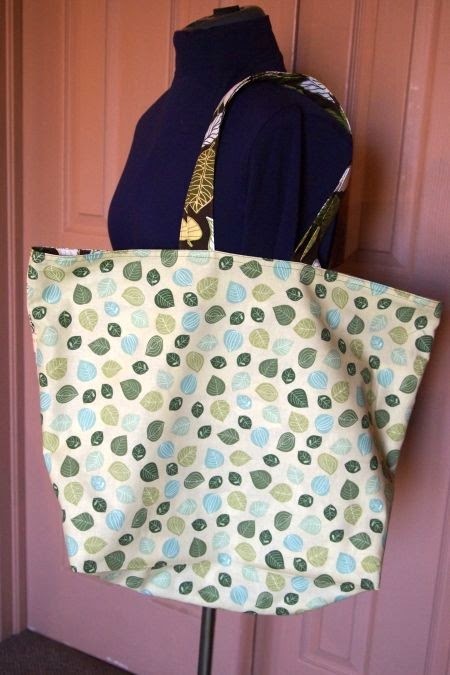 Now that I've made this super-simple tote, I'm ready to try a really nice one. The tutorial I'll be using is on The Inspired Wren blog, here. Come back next week to see how it turns out! Nice tote. I need to make a couple to keep in the car for those unexpected shopping trips. This one is fabulous! I can't wait to see your next one. Looks great! Happy Earth Day! Looking forward to next week's. 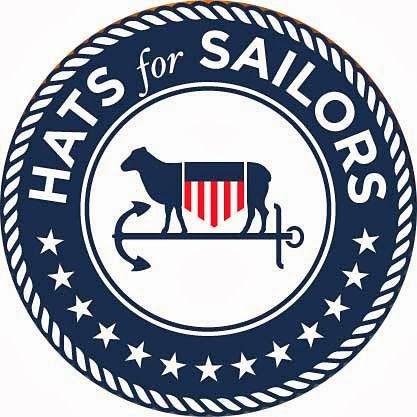 Test comment for Blogger Profile.